In case you were living under a rock (or got lost in the fog of the festive season -- either are entirely possible) you may have missed the furor that erupted last December when Queensland mum Hollie Singleton invited some parents to a "pox party" held at her home. For those who don't know, a chicken pox party is an outdated practice employed prior to the introduction of the chicken pox vaccine whereby parents would bring their children over to the house of someone who was infected with the disease. Given the highly contagious nature of chicken pox, the thinking behind such events was, seeing as the child would probably contract it at some point anyway, why not catch it early and get it over with? While there is technically no need to host or attend such "parties" any more, some anti-vaxxer parents still find the method preferable to having their child vaccinated against the disease. This was the case for Singleton, who issued her pox party invite to members of an anti-vaccination group on Facebook. "My son has a full case of chicken pox," she wrote. "We are all home together for the week. If anyone wants to clear this bug now and get it over with please come to Brisbane and visit us. We are here to infect only those who want it!" Her invitation spread like, well, a case of the chicken pox and sprouted numerous articles and opinion pieces in the media. 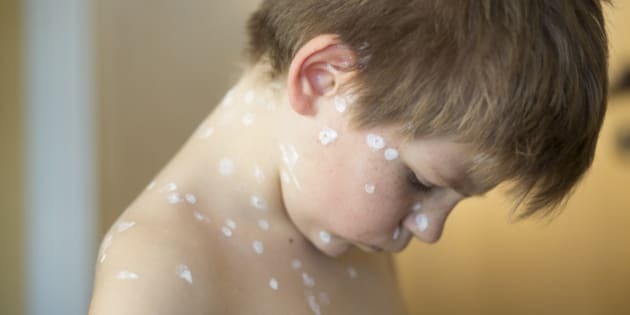 Now the outrage has simmered down a little, The Huffington Post Australia thought we would revisit the subject of chicken pox parties and what they mean for your child's health. "Chickenpox parties involve parents knowingly infecting their children with a serious viral disease. It is absolutely not recommended by any health authority or medical practitioner," Dr Anita Heywood, senior lecturer at the School of Public Health & Community Medicine, University of New South Wales, told The Huffington Post Australia. "It was apparently common prior to the availability of a safe and effective vaccine with the rationale of ensuring their child was infected prior to adulthood, when the complications of chickenpox are more common. However, the disease can be serious in children too. "Before the vaccine, we had about 200 hospitalisations in infants less than one year of age and around 640 in children aged one to four years each year. Complications (which occur in about one percent of cases) include secondary bacterial infections on the pox, pneumonia and, rarely, encephalitis and meningitis (brain swelling). "Infection during pregnancy (typically during second trimester) can result in congenital varicella syndrome with skin scarring, limb defects, eye anomalies and neurological malformations occurring in the unborn child. Infection close to delivery can result in high rates of shingles in the newborn. Infection during the neonatal period can result in very severe form of chickenpox in the newborn with reported mortality rates of up to 30 percent. "Perpetuating the transmission of the virus by hosting chickenpox parties exposes susceptible people, including infants, pregnant women and non-immune adults."